Ah yes, memory take me back to a time. Back to those days of my youth where innocence and sweet ignorance protected me as much as my kaleidoscope memory now blurs the edges and shields me from the pain in my past. My memories seem to change over the course of time, kind of how an ice cream cone gets that slick sheen just before it deforms and melts down the cone. Time has a way of smoothing the edges and refining what is kept, and what is lost. But, isn't that a good thing? I mean, who would want to remember all the bad times, all the pain given and received in the process of becoming an adult. I remember back to when I attended high school. Yes, a trying time for most, I'm sure. Some recent writing research forced me to remember those times. Not just the good times but all of them; some quite painful. I must admit that in my high school days, I was something of a fly on the wall. I didn't really belong to any particular group or click, wasn't popular, and probably wasn't remembered by most. I tried to fit into many groups. Let me see, I was in the drama club, debate club, hung out with the geeks while I took drafting and creative writing. I hung with the stoners, and the gearheads. I tried out for football, which turned into a catastrophe. I joined the cross-country team and found that running wasn't as easy as I thought. I didn't know who I was back then. I had no idea what I wanted to be. Sometimes I still don't know. But at that time, I was sure that others knew exactly who they were and how their life was going to come together. Of course, with the wisdom of age, I realize that my estimate of just how many were endowed with this magical knowledge was probably way off. I suppose the saddest part is that I lived in what some would consider paradise but never saw it. I could walk to the water from my house and go fishing. 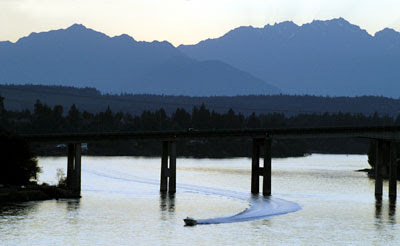 Every day as I stepped out of my door, the majesty of the Olympic mountains graced my vision. On a clear day, I could even see the rugged peaks of the Cascades or even the white top of Mount Rainier, perpetually blanketed with white glistening snow. 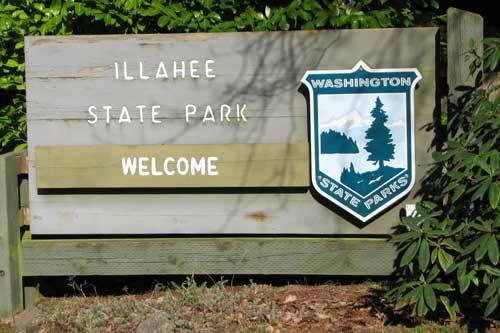 Within minutes, I could drive to Illahee State Park or Kitsap Lake. I know that time has been cruel to my memory in order to be kind to my heart. Deep down, I know that the place I grew up is not as pristine and wondrous as I remember. I had the chance to return to Bremerton, Washington in December of 2007 to make arrangements following my Father's passing. I didn't have much time (for obvious reasons) to look around the area and reminisce, but I saw enough to know it had changed. Even things I knew, buildings, roads, ferry docks, were not as I remembered them. This truly was a painful event. The news of my father's passing came from a phone call. He hadn't passed yet but was found in his home a few days after apparently having a stroke. There are very few people that know that my childhood was a painful one. My father was an alcoholic, among other things, and when I was about two years old he and my biological mother split (I'm still not sure if they were ever really married) and my father got me, while my mother got two girls. I spent the next few years being shuffled around as my dad changed jobs, mostly living with my grandparents. After I started school, My father remarried. I was suddenly put into a new house with a new mom, and two new siblings. My adjustment was rough to say the least. To this day I truly love and respect my step brother and sister but we never really grew that close and I don't know why. I certainly resisted my step mother who I felt (at the time) was unjustly harsh on me and uncaring. I know now that this was not true and cannot blame her for any resentment she may have felt after having me thrust upon her while my father worked, drank, and spent money. Anyway, by the time I entered high school, I was bitter, quiet, and emotional. I joke about my childhood to friends but, in my soul searching for a writing project, I found remembering things as they really were to be saddening. Oddly though, some of the things I remember with fondness are people. Names of these people stay with me for unexplained reasons. Some of them were friends, others mere acquaintances. Yes, I'm going to mention some of these people by name so, if you are one of those people, forgive me. First and foremost, the name I must mention is John Tyler. John was my best friend and probably the only person I knew more screwed up than myself. We shared much in our friendship, from broken shopping carts (buggies for those of you reading this in the South) throwing rocks at his pet rat after launching him in a boat made from a milk carton, learning to drive in his mom's Ford Pinto-Good times. I often miss John but keep in touch (more with his wife) on facebook. We both eventually left the area for military service. After that, we drifted apart. Mike Epps was an acquaintance although I'm not sure how close we were as friends anymore. I think he's still in the Northwest working for Boeing or something if he hasn't retired already. Mike played a key role in my developing social attitudes. Sounds strange but I've come to rely on some of those early lessons while living in the South. You see Mike is black. Funny thing is that I never really saw that. Sure, his skin color was most definitely more pigmented then mine. His cultural experiences growing up were different than mine, but we both understood those differences accepted them, maybe even enjoyed them, and moved on. Overall, we had the same aspirations, hopes and dreams. In order to fully understand why this was so important to me, one would have had to have grown up in Bremerton, Washington. The population of anything but Whites and Japanese in the area was nothing like the rest of the country. I'm certain I barely knew Patience Bassett throughout high school but her name sticks in my head I think because of her brothers. I think one of their names was Luke but not sure about the other. I just remember it seemed they were a very caring family that stuck together and I admired that. There are many other people I think of even to this day. Mostly, they are all part of a fleeting and unreliable remembrance of past. Most are names that have come up in social sites like facebook, and I find it nostalgic to ponder how they became who they are now. I suppose the point to this post (if there must be one) is that we truly are a world of brothers and sisters in a sense. One can never completely leave their past behind, believe me, I've tried. And now, as my own children have moved out of the house and are creating their own lives and families, I wonder if they have found who they are; or will they continue to flounder for years as I did, and as I suspect, the majority of my graduating class did? I think that the hardest part of growing up and growing old is finding who you are as a person. I wish the best to all in this endeavor although I cannot really speak with any authority on the subject. I'm not convinced I've figured out just who I am yet. Heartfelt post. No, high school isn't great for most people. And I suppose at the time a lot of us never knew or understood exactly what other kids were dealing with at home. When I think about it now as a grown up, it's sort of heartbreaking what I remember of certain friends and their situations. I do sort of wonder what happened to them. Thank you so much for your comment. I wanted to write so much more but was afraid it would just bring readers down. It is truly amazing how much is learned after the fact but I guess that's we grow as people.